Get this clean professionnal Excel spreadsheet that will make your homes for sale comparison a breeze! If you're currently looking for a real estate property Compar'home is a must-have. Have you ever wanted a simple tool that will help you compute all the figures regarding your real-estate price & investment? 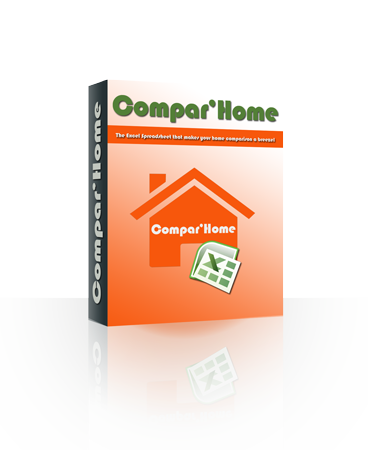 Comparing mortgage rate, condo fees, total amount of instalments, etc is now a breeze with Compar'Home! Compar'Home spreadsheet has been developed on the Microsoft Excel platform making it easy to work on any computer worldwide. It is compatible with Excel 2000, 2003, 2007 and 2010 and most of the Excel-compatible software. Even if you're not an Excel expert just open up the file, you'll understand right away how it works. If you don't, please follow our tutorial. You can play around as much as you want with the spreadsheet. We have locked the core cells so that you can't screw up the file! Anyone can use this file. Please share it to your friends or relatives who are looking for a property and who want to compare selling prices. It will make them save few hours of comparison calculation and they will be grateful for that! If you're looking for a property for sale and you've started visiting and noting features of each property on your little notebook, Compar'Home is for you! You'll be able to note anything you've seen on the property you've visited and compute mortgage calculation for each property in one click. For one of the biggest financial decision of your life, you don't want to miss a thing! Copyright © 2019 For Sale Property Help - Compar'Home. All Rights Reserved. Compar'Home and ForSalePropertyHelp.com are properties of Begin with B Inc, a Calgary Web Design company.